Project Care Track saves lives because we are able to find clients with more accuracy and in a shorter amount of time. With Project Care Track, the missing are typically found in about an hour. The average search time for someone without a bracelet or tracker can be up 12 hours, increasing the likelihood of a bad outcome. Your support ensures that this program, which is so important to Snohomish County residents affected by Alzheimer’s, autism or other cognitive disabilities, remains a viable resource for the communities we serve. The Alzheimer’s Association of western Washington endorses and supports Project Care Track. We recognize that this new technology will provide an important safety net for those affected by Alzheimer’s disease or related dementias in our community. 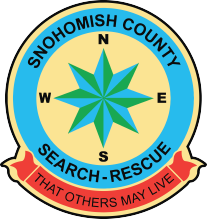 Sponsored by the Snohomish County Sheriff’s Office through Snohomish County Volunteer Search and Rescue. The tendency to wander is prevalent among people that are suffering from Alzheimer’s disease and other forms of dementia. 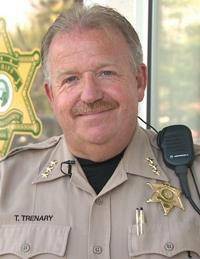 People with Downs syndrome, Autism and traumatic brain injury also exhibit this tendency. A lost person with Alzheimer’s or a related illness or injury represents a critical medical emergency. It is estimated that 59% of people with these illnesses will wander and become lost. An elderly patient left outside for more than 24 hours will have their survival rate cut in half. Efforts to intervene and locate them to prevent a tragedy are often frustrated by the patient’s inability or unwillingness to communicate with rescuers. Traditional search methods rely on the ability of the lost person to respond to the calls of the searchers. Project Care Track is designed to give an “electronic” voice to those who can’t communicate. It becomes the life link to the patient and allows the search to end quickly and successful in many cases. It is the safety net that can give a caregiver great peace of mind. Each client wears a one ounce electronic bracelet that emits a unique radio signal around the clock, 24 hours a day. When needed, a call to 911 brings a unique highly trained and experienced team that can track the radio signal and who has special training in working with patients who are struggling with these illnesses and conditions. We will be glad to answer your questions related to enrollment and fees. 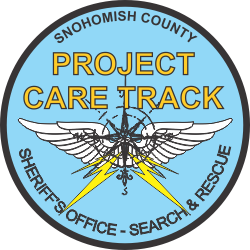 Project Care Track is administered and funded through Snohomish County Search and Rescue, a non-profit organization. Donations are needed to supply bracelets and support for those that do not have the financial resources to participate but need to be protected. Call our information line at 425.388.3825 to find out how you or your organization can become involved in our one-on-one sponsorship program. 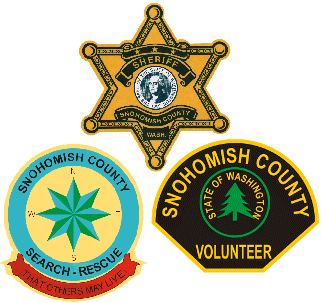 Project Care Track is a collaborative effort of the Snohomish County Sheriff’s Office Snohomish County Search and Rescue and the Sheriff’s Volunteers; joining their resources to provide a comprehensive safety net for the most vulnerable citizens in our community.